As you are reading this blog, I am at a spiritual formation retreat led by author, Ruth Haley Barton, in the greater Chicago area. This is the second of nine quarterly retreats I am taking over the next three years (my first retreat was in January) to deepen my spiritual walk with God and to learn how I can help others in their spiritual journey. One of these days I’ll write about my Retreat experiences with you – I strongly believe that taking time for spiritual retreat is a necessary rhythm for our lives as Christ followers. But this blog entry is to “introduce” you to Ruth Haley Barton and to some of her books that have profoundly touched my life. Ruth is one of the best Christian spiritual formation writers I have read in recent days – and I’ve read many (kind of a necessity while studying for your doctorate in spiritual formation!) What separates Ruth from the others is her ability to effectively communicate how spiritual practices or disciplines are used to develop our inner being (soul) towards Christ-likeness. She is also very transparent, using stories from her own experiences (including her failures) as a way to explain how spiritual practices help connect us to God and bring forth transformation. Her writing is engaging and relevant, yet deep and profound. I have often called her the “Richard Foster” of the 21st century – which is a very high compliment, as I had the privilege to study under Richard at APU in the 1990’s. “Sacred Rhythms” – this is a book about spiritual disciplines/practices. However unlike most books about spiritual disciplines, Ruth does not simply list the disciplines and tell us how to do them. Rather, she starts with our need and predicament as people who are enslaved to the “rat race” of life. We have been marching to the beat of the wrong drummer which produces a life of anxiety, frustration, and purposelessness. The key, of course, is finding a lasting connection with God. This connection is facilitated by entering into a new rhythm of life (hence, the title). Richard Foster taught me the profound truth that spiritual disciplines position me to receive grace from God. Ruth Barton teaches me the additional perspective that it is the rhythm of spiritual practices that proactively facilitates a life-giving flow of grace into and out of my life. If spiritual disciplines seem challenging or unpleasant to you, this is the book that will change that perspective forever. Ruth’s explanation of Sacred Rhythms gave me a deep desire and motivation to engage in the disciplines more fully and with greater clarity. “Strengthening the Soul of Your Leadership” – yes, I know the title seems a little quirky but this is one of the best books I’ve ever read. If you are a Christian leader (pastor, ministry leader, small group leader, youth leader, etc.) this is a must read. The premise of this book focuses on where we, as leaders, lead from. Many leaders lead from the wrong place: their dysfunctional upbringing, expectations of others, need to be wanted, ego. But God desires his leaders to lead from their soul. Ruth uses the life of Moses as a backdrop to teach us how soul-care and soul-development produces the most effective, powerful and Christ-like leaders. 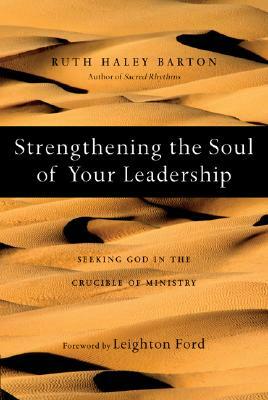 As a former church staff leader and current CEO of her own organization, Ruth also weaves in very poignant stories with God that have helped her heal and grow as a leader who operates from the “strength of soul.” I use this book with my seminary students at APU as well as my leadership team at CBC. What books have helped you in understanding spiritual formation and spiritual disciplines? Have you read any of Ruth Haley Barton’s books? Any comments? I am currently reading “Sacred Rhythms” per your encouragement and agree with you that is very good and worth investing time and energy into it. There is a practical approach that is real and alive. Like you said, it is not a to-do list, but a guide by an experienced individual taking us into depths of intimacy with God.